You have to worry when the Ombudsman asks the citizens to explain the ‘point of complaining’ but let me set that in context. PHSO have actually asked film students to put together a 45-second film on the title ‘What’s the point of complaining’ and enter a competition to win a cash prize of £400. If anyone could educate the Ombudsman on this subject with a single 45-second film then it would be worth a lot more than £400. film-competition-whats-point-complaining Let’s see what the Parliamentary and Health Service Ombudsman (PHSO) have to say about their complaint handling service. So according to PHSO they provide an ‘independent’ complaint handling service for citizens with complaints about government bodies and the NHS. In fact, they are the only body who handle individual complaints apart from the occasional investigation by NHS England and the even more occasional public inquiry. They give resolution to citizens caught in a dispute with public bodies and they also ‘drive improvements’ by sharing the findings of their investigation reports and so preventing further harm. So far so good. 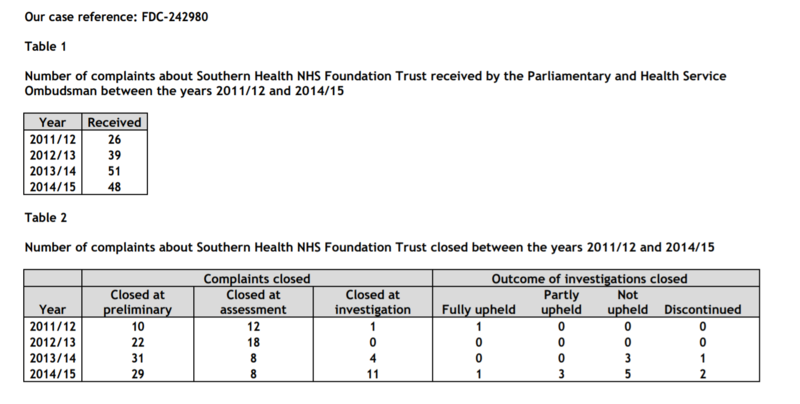 During the time of endemic failures at Southern Health (2011 – 2015) the Ombudsman received 164 complaints from members of the public. These complaints should have raised concerns but PHSO investigated only 16 of these cases, (9.7% of the total submitted) and upheld to some degree just 5 (3.0%) This low uphold rate goes some way to explaining why issues at the Trust persisted for so long, causing avoidable death and suffering to many and why ‘no lessons were learned’. Patients suffered “significant harm” because of multiple serious failings by a “dysfunctional” NHS trust… Liverpool Community Health NHS trust (LCH) provided poor, unsafe and ineffective care to patients, including inmates at HMP Liverpool, the scathing report concluded. Dangerous and dysfunctional services delivered by LCH without redress for at least a four year period. Surely some of the people who suffered would have made a complaint to PHSO. The table below shows that from 2010 – 2014/15 the public made 43 complaints to the Ombudsman. These figures demonstrate a steep rise from 2012 onwards yet the Ombudsman investigated just 5 cases (11.6%) and upheld none (0%) in this time period giving LCH an unblemished record. Since 2010 the Ombudsman has partially upheld only 1 complaint against LCH giving a green light for dysfunctional services. what is the point of PHSO? Next Next post: Thinking of taking court action – then read this. Has anyone else been told by the PHSO that they cannot have their complaint investigated because they can’t prove that it’s the sole cause of injustice? This came from Mr Behrens himself, and it’s not in any of their publicity. It was the third reason why they wouldn’t investigate, so it may not be any more true than the others, but seeing their new publicity left me wondering. As for what the point is of the PHSO, it’s to let government employees cover up for their colleagues while giving the illusion that there is a fair complaints system. But no one who says that will win the competition. Only been with PHSO for 10 YEARS so I have a fair idea what I am talking about, All PHSO’s encountered so far have been dreadful. Seems NOT resolving complaint is name of game, My son died under Duty af Care in NHS hospital. where he was detained “for his own safety- NOTHING but now “historic” due to their delays. DONT WASTE YOUR TIME! The answer is that there is no point in complaining – not to the PHSO anyway. Because the chances of you getting anywhere are remote. And you’ll get so frustrated by the process that you’ll end up feeling even worse than you did before you started. Absolutely devastating. Completely nails it. Complaining to the PHSO is a pathetic charade that fails both the individuals who complain and the public in general. There should be outrage and a public inquiry, but will anyone listen or pay attention? Over to you, Mr Jenkin. Please keep pressing this issue. I find it incredible that Bernard Jenkin M.P> and his committee are still failing to do anything constructive about this appalling system of investigation, when people are not only dying but also being permanently disabled through errors made by staff in what is in effect a gigantic and incompetent organisation called the NHS. which is diverse in so many parts with Trusts operating which cannot be trusted. And that’s the best anyone will get from PHSO. That is their formula. And sometimes it’s even worse as your figures for LCH show. It’s a joke that RB continues with the spin when he can’t hide what’s been going on. These naive young film students will be provided plenty of that PR and told “read this and then explain in your film what the goal of complaining is” they WON’T be told “read this and then dig into the truth and produce a film on the massive disparity between our claims and the reality”. And if any are astute enough (or maybe I should say *brave* enough, as it doesn’t take Einstein to see the truth) to tell the truth, they won’t have their film even in the running letalone winning the PR exercise. It’s probably why they chose film students, so eager to win and focus on the technicalities that they won’t tax their poor little brains with anything so inconvenient as the truth, or blot their copy book from so early on in their careers. My heart goes out to these people. Those whose genuine complaints are never upheld may well wonder what is so special/ different about the very few which do get upheld. As a successful complainant myself I have to state it was throughout an extremely uphill battle. I faced many lengthy delays, the agency concerned was in total denial and many extremely serious lies were told which appeared to go unchallenged by PHSO. I am convinced the ONLY reason my complaint was finally upheld was because I had retained a vital piece of evidence which in the end could no longer be igored (an official letter I had sent to a very ambitious SENIOR politician outlining my case and pleading for assistance). The receipt of this letter was at first denied but I had kept proof of postage and so I threatened to take legal action against the agency whilst also giving the letter and proof of its receipt to the media. Politically this would have been extremely sensitive and in the end my complaint was upheld. Very sadly my experience leaves me with the belief that unless the complainant can themselves provide incontrovertible evidence to support their case, then the lies of individuals and an agency will be given precedence over the word of a complainant. Some time ago I was in Leicester Royal Infirmary, due to their endoscopy unit being out of action I had to go to the General. The nurse who accompanied me could not have been kinder, I was in a wheelchair, pyjamas and dressing gown with 2 cathetas and a drip. The ambulance was booked for 12:30pm but was not available, after 30 minutes sitting in the drafts waiting area and the second time the nurse had asked at the desk, she gave the cause as “those bloody Freemasons”. I was shocked, what had Freemasons got to do with it? “Don’t you know” she said, “ambulances are used as free taxis by the masons, everyone knows”. My appointment was at 3:00pm, it was only after the nurse told the manager that she was taking me back to the ward that an ambulance suddenly appeared. It was now 2:30, the ambulance was a minibus. The nurse refused to have me ride in a minibus. I told the nurse that we could manage and we had waited 2.5 hours. So we managed to get into the minibus, the nurse holding my drip and I holding the catheta bag. The driver said that he was waiting for another passenger. I was getting very cold, at 2:45 an elder patient approached shuffling in his slippers and got on board the bus. The driver said that he was taking this man to Wigston first. When questioned by the nurse that we had to be at the General by 3:00, the driver said we had plenty of time. No way would the driver get to Wigston and back to the General in time. I expressed my concern about being driven around Leicester in my condition. The driver assured me he could manage it. OK, then let me get off this bus because I am not being driven to Wigston and back when the General is only 5 minutes away. The driver looked at the old man, who nodded. The driver took us straight to the General. After the endoscopy, the nurse ensured that I would be taken back to the LRI in a proper ambulance. When the nurse said that we had to wait two and a half hours for an ambulance, one of the ambulance crew said, “that’s the masons, taxis before patients!” I made my complaint to one of the doctors and to the hospital almoner, not sure of any action taken. A senior barristers opinion was obtained by a campaigning body using publically raised funds, that stated over 20,000 complainants a year to the PHSO over a decade ( over TWO HUNDRED THOUSAND ), were gagged using two pieces of government legislation that was not used for the purpose it was intended for. An excellent example was the Financial Statement for Land Registry for the year 2009-2010 , where it’s CEO ( Marco Pierleoni ) stated there had only been three complaints about Land Registry to the PHSO ( top tier complaints body) of which two had been quickly dealt with and only one complaint was left in the pipeline for that year. I think l am that “one complainant” , well l know my MP wrote sending them my letter of complaint in March 2009, that l was advised to write to the PHSO by Denise Dewson of The Independent Complaints Review ( first tier complaints body) and also Evelyn Holt of Peterborough Land Registry. Loud and clear, don’t bother with the PHSO, all that money from the public purse to pay a protection racket. 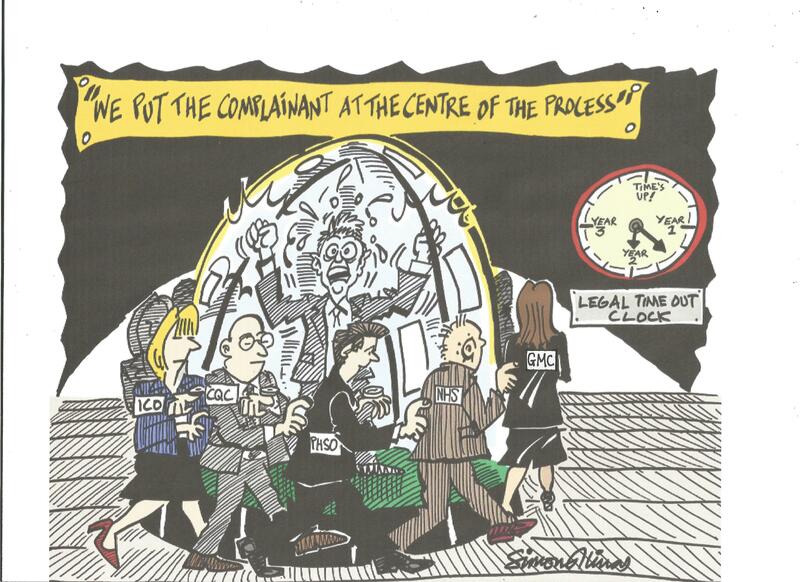 Complaining to the PHSO has nothig to do with genuine complaints or any related issues such as improving matters for the future, learning lessons and so on… the cartoon is quite apt in this case as the expensive tax-payer funded process is as tragic as it is comical on the black humour level. The students will produce a piece they believe in now, having swallowed the elaborate theory, but future practice will teach them the truth if they or anyone they know has the misfortune to be led along this publicised path of deceit to ‘complain’ aka pumping up PHSO and government pr, steadfastly keeping the official caudron of horrors for complainants brewing merrily away… I feel another cartoon coming on! The country itself is in need of TLC. You would think that the PHSO and indeed the NHS would thank us for identifying major problems and potential tragedies for them to learn from but they don’t so you have to conclude that they want unavoidable pain,suffering and death to continue. How could you draw any other conclusion?